Now, doctors’ offices and emergency rooms can be used only by those who really need to be there, and this reallocation of care and money means that we can bring the cost of a diagnosis down dramatically. At the same time, patients have the answers they need in minutes, taking away the worry that comes with the age-old process of waiting for an appointment when you’re sick. As part of my series about “Bleeding edge” technological breakthroughs that seem copied from science fiction, I had the pleasure of interviewing Pascal Zuta, Co-Founder and CEO of GYANT. 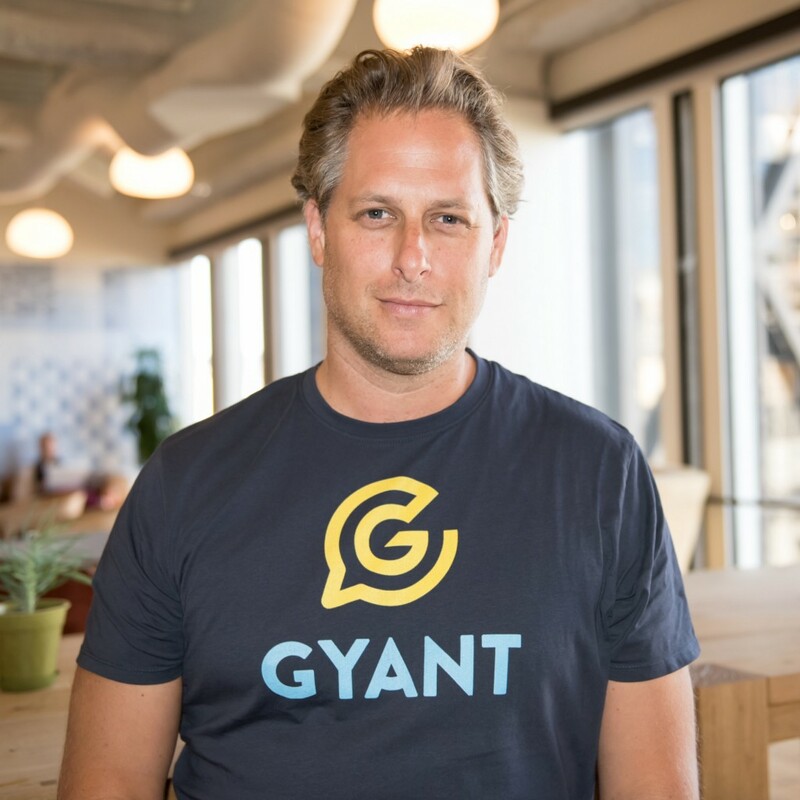 A German entrepreneur, Pascal co-founded GYANT in 2016, as the first AI-physician care service that lets healthcare providers prescribe for and treat the most common, non-urgent illnesses — as well as deliver aftercare to ensure patients’ recovery. Pascal began Germany’s largest doctor appointment booking company (Arzttermine.de) in 2011, and was previously the CEO of Aeria Games & Entertainment as well as a cofounder of Invincible Brands, a brand builder in the healthy living space. Coming from a background in marketing and eCommerce, Pascal has also been an investor, advisor, and filmmaker, with a Master’s degree in business and a Doctorate in media studies. Today, he lives in the San Francisco Bay Area with his wife and three children. Thank you so much for doing this with us! Can you tell us a story about what brought you to this specific career path? / Was there a “tipping point” that led you to this breakthrough? Can you tell us that story? I’m a father, and remember a few years ago — right after Christmas — finding a bump on my young son’s chin. My wife and I didn’t know what it was, and because it was the holiday season in Germany, everything was closed. We couldn’t get in front of a doctor for days, and grew increasingly anxious that something was wrong. We felt helpless. Luckily, everything wound up being fine, but I’ll never forget that feeling. It led me to start what became Germany’s largest doctor appointment booking company, in 2011, so that people didn’t have to go through the same experience as we did. Before that, I’d been the CEO of Aeria Games, a large video gaming company with products that engaged millions of people every day. I started thinking about all the ways that people interact with video games, and thought that similar techniques could be applied to other fields and have a real impact. Reflecting on both my own experiences within the healthcare system, and those of others, I realized that this was an industry that could benefit from these kinds of products. I wanted to create something that could engage both patients and doctors and deliver better care that would lead to improved outcomes. This all led me to found GYANT in 2016: the first AI-physician care service that lets healthcare providers prescribe for and treat the most common, non-urgent illnesses — as well as deliver aftercare to ensure patients’ recovery. In 2014, I was CEO of Aeria Games, and traveling on business in Asia with my GYANT Co-Founder, Stefan Behrens. We were exploring different video games and behaviors in Japan and Korea, and found that AI-driven conversational programs were very popular there. People had no problem confiding in and talking with a computer, just like they would with another person. And what’s more, many of these programs were focused around romantic interactions — where people would knowingly hold flirty conversations with AI, like they were talking with their virtual girlfriend or boyfriend. My lightbulb moment came when I was standing at a crosswalk in Tokyo, and saw a woman next to me, seemingly texting on her phone, giggling and blushing at the conversation. When I looked over, I saw that she was actually chatting with AI, but was so invested in that virtual relationship that she felt an authentic emotion and attachment to it. I was intrigued by this, and how complex these interactions must be, both in the natural language processing technology, and the ability to convey empathy and develop relationships to keep people coming back. I thought, here is an opportunity to use this type of interaction to benefit people — to convert that empathetic and relatable interaction into trust and help when you need it. This inspired the creation of GYANT: a friendly, knowledgeable AI that could develop a meaningful relationship with people, but help them get the care and answers they’re looking for when they are feeling sick. Can you tell us about the “Bleeding edge” technological breakthroughs that you are working on? How do you think they’ll help people? GYANT is a new care service that uses AI to empower doctors to do their work, better. Bringing together the convenience of an app with the knowledge of a medical expert, GYANT saves patients the time, frustration, and travel to the doctor’s office, while at the same time reducing the burden on the healthcare system. GYANT allows physicians to meet with patients and inform, diagnose, and prescribe treatment for them, all through one in-app consultation. We are using a simple and friendly messaging interface and smart technology to make the patient triage and diagnosis process faster and easier, and working with licensed medical practitioners, enabling them to engage closely with patients and treat more cases. GYANT is trained on the electronic health records of the health systems where we work, in order to have the most relevant demographic and seasonal factors for the populations we are caring for. The platform is also seamlessly integrated with patients’ electronic health records, remembering each patient over time. When GYANT interacts with patients and sources diagnostic information that physicians corroborate, the AI algorithm gets smarter and more personalized to provide better care. Our mission is to improve healthcare by making it simpler and more efficient for both providers and their patients. GYANT is globally accessible, works in six languages, and is free to use. We’ve already engaged in millions of patient interactions, and are expanding our reach to more healthcare systems and consumers for wider reaching, long term care. GYANT shows empathy and builds relationships with patients, and creates a seamlessly efficient experience, from the moment you feel under the weather to days after you’ve received a treatment plan or medication. When people use GYANT, they’re directed to the right information and place for their care, and providers are able to help more people in less time. This means that physicians and healthcare systems can be more efficient. If you look at any industry, one of the biggest challenges is that everyone is focused on the same things, and solving the same problems. That also means that all those people are overlooking the same things. One of the biggest issues we’ve seen in healthtech and Silicon Valley is a laser focus on technology — to the point of forgetting the importance of human interaction and empathy. But, when you look at doctors’ relationships with patients, it’s the only thing that matters. We believe that people and technology must work together to deliver the type of experience and care that people expect. We have developed a platform that purposely maintains the closeness of the physician-patient relationship, and has components of empathy throughout, from the initial conversation with GYANT’s AI, extending to aftercare. We want physicians to gather the information they need more easily, so that they can provide better care from the beginning. To that end, we’ve tightly integrated AI and people, so that care can remain an interpersonal experience — but become a better one, for both patients and providers. When working with AI, especially within an industry as intimate and consequential as healthcare, it’s important to think about empathy, and preserve the humanity underscoring these interactions. We believe everyone should understand their health and have access to the care they need. Our algorithms get smarter with each patient interaction, so diagnoses and treatment plans will get more personalized for everyone to receive better patient experience, wherever they are. That means that GYANT will only get better as more people use it. Although GYANT was founded 2016, we have been focused on developing our product and perfecting the patient experience. We are only now beginning to talk publicly about the work we’ve been doing, and have begun working with a network of influencers who share their experiences with GYANT with their communities of followers. My grandfather was a professor of economics, a columnist in one of Germany’s biggest newspapers, and a great intellectual. He used to have two big chairs in his living room, and when I was little, he would sit me down, sip his German Schnapps, and talk to me about economics and the world. My grandfather taught me to invent things that help the world, but adapt to fit into what people want. People shouldn’t have to — and won’t — change their lives to use a product. But if you create something that’s good enough, and show people its impact, they’ll flock to it — and you’ll be able to make a difference. I think a lot about entrepreneurial responsibility, and have kept this with me throughout my career. That responsibility led me to create a company that expands people’s access to quality healthcare, with GYANT. My co-founder and I often say that we want to bring the cost of a diagnosis and treatment down to the cost of a bottle of Coke. You can find a bottle of Coke — unhealthy, full of sugar — almost anywhere. It’s cheap and universally known. But not everyone has that same access to a doctor. My success in other fields as an entrepreneur has allowed me to create a company that can help billions of people who don’t have this access to care today. Long-term company strategy is something that is widely taught as “the way to win” — but in reality, you win through thinking through the right tactics in the short term. The founder of the gaming company I worked for (and later led) taught me this. He pushed us for one thing only: to be nimble, react quickly, and figure out the next 4–8 weeks at a time. He did have an idea of the long-term strategy, but it was his instinct and ability to identify the right short-term opportunities that made the company grow. Say no. Sometime it’s better to do less. I believe that there’s no such thing as a small project. Everything you do eats into your resources, and resources are limited — especially if you’re a young company. As a founder, you often have to make these decisions that aren’t the most popular. Sometimes you’ll need to pull the plug on a project that’s 80% done, even though finishing it would feel so much better, because it’s not a priority anymore. To succeed, you need to be the person in the team who says no, even though — and especially because — it can be hard for most. Take that responsibility. If you find out about one single problem, there are many more. I’m not a technical person, so I learned early on to trust my gut. If I test a new version of our app, or any other piece of tech, and I find a big bug quickly, I know that there are many more to come. What are the chances that things only fail on my device, only on my customer journey? Chances are that if there are problems for me, there are many more elsewhere. If you find an issue, look deeper, find others, and find the root cause. As an entrepreneur, I haven’t had many jobs where I’ve had a boss. But once upon a time, I was a tour guide in the Dominican Republic. Every day, I would invite tourists into a cafe in a hotel, where I’d sit with them and tell them about their options. The director of the hotel wanted to save money, so he started turning down the air conditioning, resulting in an uncomfortably hot room where no one wanted to sit and talk about — or buy — tours. One day, I went to my boss — the head of the tour company — to tell him about the situation. He sat with me, listened to my story, and as soon as I’d finished, said “Let me take care of this.” Right there, he picked up the phone, got the hotel director on the line, told him to always keep the A/C on. When he hung up, he looked at me and said, “Thank you for telling me. It will not happen again.” Even now, 20 years later, I still feel loyalty to my boss. He never questioned my story, and solved my problem right there. It’s something I valued enormously then, and try to do for my employees today. I wondered how such a successful person doesn’t do math, but remembered what he said. He hadn’t done any math in 20 years. He did, however, do lots and lots of math and analysis until he was 45. What I learned that day, was that early on in your career, you should work by analysis. That’s how you learn to think precisely and critically, and more importantly, how you can train your gut to know what’s right and what’s wrong. Once you educate yourself and develop that trusted feeling, you can use that instinct to guide the latter half of your career. He ended up giving me the money. Today, more than ever, I believe we need to foster a meritocracy of ideas, driven by scientific rigor and support. I think it’s important to build a culture of entrepreneurship that’s motivated by a responsibility to improve the world we live in. Every year, I work with a young entrepreneur to foster an idea and help them found their own company. I think mentoring and supporting the energy and passion that fuels great ideas is one of the most valuable ways that I can make a positive and significant impact on people’s lives. My favorite quote: “If you’ve never missed a flight, you’ve spent too much time at the airport.” In a nutshell, it means that you have to reach a point of failure to know how far you can go. This plays into every choice I make as a founder, every goal I’ve set for GYANT, every product decision, and every time I’ve stopped and decided to think bigger about accessibility and the impact this company can make for people’s health and their lives. If you’re too afraid of failing to push yourself to the limit, how else can you know if you’re thinking big enough, or being ambitious enough? When people feel under the weather and turn to Google to find more info about their symptoms, they often become scared and confused. The consequence is that they walk into the first open door they find, often an emergency room or a urgent care clinic. Many health plans — and more and more providers that take financial risk for patients — take on reimbursements for unnecessary visits to expensive care settings. GYANT is a new care service that combines the efficiency of an AI with the expertise of physicians, and helps physicians do more. In 81% of cases, providers can diagnose from the information collected in GYANT’s first patient conversation, leading to an average encounter time of under 3 minutes per patient. GYANT costs far less than a telemedicine appointment, offers a 95% emergency room redirection rate, and 3x higher utilization than a video call based service. Readers can follow GYANT on Twitter @I_AM_GYANT or on LinkedIn. The Future Is Now: “Now AI is making the process of triage and diagnosis faster and easier”, With… was originally published in Authority Magazine on Medium, where people are continuing the conversation by highlighting and responding to this story.